I had taken yesterday off from work because I felt like crap. I slept for most of the day taking time out only to watch the Kenhin film (reviewed the last two days) and a bit of the Mets/Rockies game. Heading to bed after the baseball game I fumbled through a couple of DVDs trying to find something to watch to fall asleep to but YONGARY, a disc of Mr Wong films with Boris Karloff and some Mr Moto's with Peter Lorre all failed to do the trick so I popped in a bargain disc of four Sherlock Holmes films with Basil Rathbone and Nigel Bruce- I may not have fallen asleep but it did relax me. The films on the Holmes DVD are THE WOMAN IN GREEN, TERROR BY NIGHT, DRESSED TO KILL and SHERLOCK HOLMES AND THE SECRET WEAPON. I also have the films in the semi-recent restoration set with the audio commentaries and extras, but I picked up this disc since it plays for four and half hours without breaks. I'm a huge fan of the series and they have been a constant companion since I can remember. Once years ago when The Movie Channel ran all 14 films in the series in one day I stayed up over24 ours recording them and cutting out the between film nonsense. At this point they are all old friends and they have largely blurred together. WOMAN IN GREEN has Holmes tracking a series of murders that lead back to a beautiful woman who is working for Professor Moriarty. Its a grand blackmail scheme that sees Holmes life put into peril on several occasions. Growing up this was a favorite of mine as far as a kid. I think because I had a crush on Hillary Brooke from the Abbot and Costello Show. Now I find it good film in the series but nothing special. TERROR BY NIGHT is held by many people to be one of the best in the series. I think its a super little film that does what it does and gets off. The film has Holmes,Watson and Lestrade trying to protect the Star of Rhodesia diamond while on a speeding train. Once the owner is murdered it becomes a race to find the killer and the jewel before the train stops and the killer can flee. One of the best in the series this film just goes. DRESSED TO KILL is the final film in the series. It has Holmes and Watson trying to work out how a series of murders tie into some cheap musical boxes coming out of a prison workshop. Its revealed that the tunes hold the secret to the location of the printing plates for pound notes. One of the best in the series if for no other reason than you remember the various bits of the film- say Holmes going to someone he sent up for help with the differences in the tunes. I really like this film a great deal. 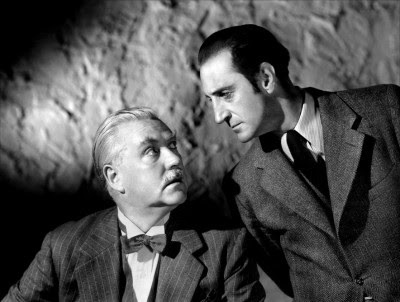 SHERLOCK HOLMES AND THE SECRET WEAPON is the fourth film in the series and the second after they jumped from Fox to Universal. The film concerns the efforts of the Nazi's to steal a new bombsite and it's inventor. To me this is one of the meh films of the series as most of the wartime films are. The films are so intent on being patriotic they aren't much fun as mysteries and are actually more espionage films- which is not what you'd expect from Holmes and Watson. Actually even the audiences of the times and especially the soldiers fighting in WW2 didn't care for the films much and they wrote to Universal asking that the films go back to being mysteries since that would help them forget the war for a while. Worth a look because all the Homes films are worth seeing but one of the lesser films.